Sorry, I’ve been pretty busy these past couple of days. I actually made this the morning after Halloween. Kevin and our roommate were hurtin’ pretty bad after their night out, so I decided to make them some hangover food to help them with the recovery process. 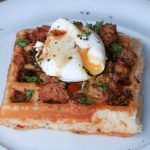 I was initially thinking waffles, but I remember we had just bought some Italian sausage earlier (which was meant to be used for Scotch Eggs – a recipe soon to come). I mean, they do chicken and waffles, so sausage and waffles sounds pretty damn good to me. 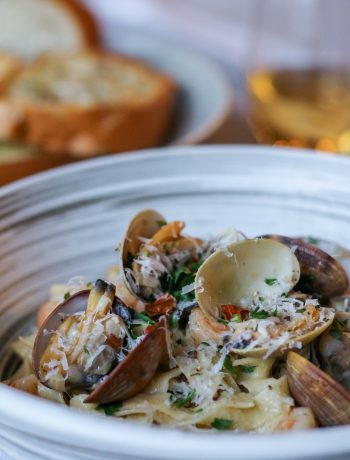 A little salty, a little sweet. 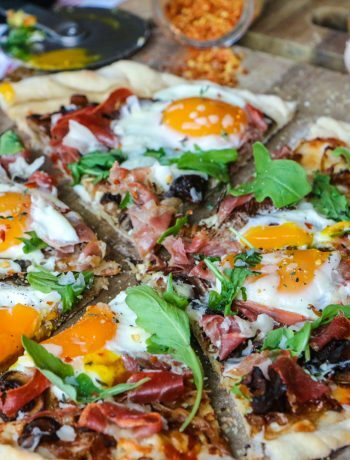 The only way to make it better was to add egg to it, because egg makes everything better- AMIRIGHT?! This recipe is pretty basic, no techniques here. If a hungover guy can make waffles, I think anyone can make this dish. The only thing it requires is some multi-tasking, but I’ll get to that later. So first thing you need to do is find a waffle batter on All Recipes (lol). I don’t really have a standard one, I usually just guestimate my amounts when I make pancakes or waffles, but Kevin found this waffle recipe here. The recipe says that it make 6, but it really makes 1 full waffle tray (4 waffles). Kevin had initially made one portion of it, then decided it was too little for the 3 of us, so he doubled it. We ended up with 8 waffles…there are still waffles in our fridge. You don’t have to add anything else to this waffle batter, but I had some carrots I wanted to use up so I grated some in there and added some green onions too. I think cheese would be a great addition to this batter, but there were slim picking in my fridge so I didn’t add any. Once you’ve made the batter, let it sit while you cook the sausage mixture. I used a cast iron skillet to cook the sausage mixture so I could keep it warm in the oven, but virtually any pan will do. Once the skillet is hot, add the sausage and break it into chunks. Once the sausage is cooked, put it in a dish. Next, cook the onions and garlic and the remaining veggies. 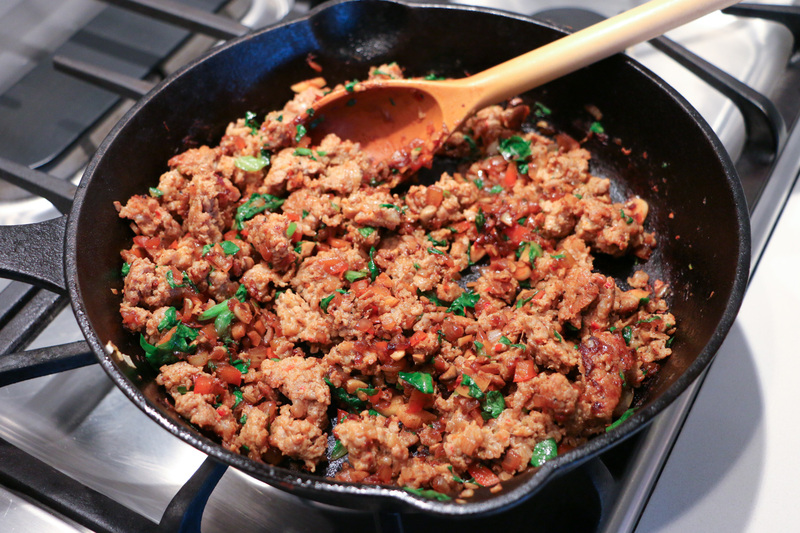 Once everything is cooked thoroughly, add the sausage back to the skillet and mix to combine. I didn’t really need to season this much, just a bit of salt and pepper. 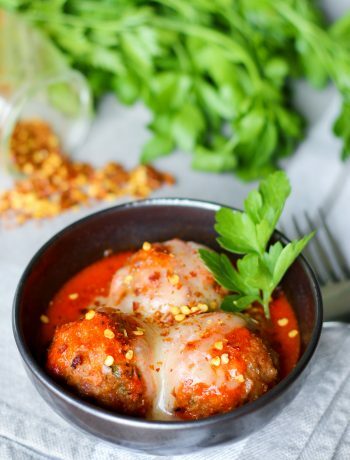 You can add some red hot chili flakes, but our sausage was pretty spicy as is, so it wasn’t needed. Keep this mixture warm in the oven while you cook the waffles and poach the eggs. Now here is where the multi-tasking part comes in. I like to have everything ready beforehand when I know I’m going to have to plate a dish with (runny) eggs in it and try to take a picture of it. I started poaching my eggs just before the waffles were finished cooking, but to make it easier you can cook the waffles first, keep them warm in the oven, and then poach the eggs. In order to poach the eggs, bring a medium pot to a rapid simmer, anything more than a rapid simmer will mostly likely break the delicate egg. I always add vinegar into the water when I am poaching or hard boiling eggs. The vinegar helps the proteins to coagulate and it also prevents your pot of water from turning into egg drop soup! While the water is heating up, crack your egg into a small dish or ramekin. Gently swirl the water to create a little whirlpool in the middle and gently add the egg in the middle. Turn off the heat and cover the pot. The eggs should poach for about 3-4 minutes. When it’s done, remove the egg with a slotted spoon and place on a paper towel lined plate to let the water drain. Alternatively, if you don’t want to poach eggs, you can fry an egg – sunny side up. Make sure you leave the yolks runny. To plate the dish, add the waffles, then the sausage mixture, and top it with the egg. I cracked some pepper and salt on top of the egg and garnished with chives. I thought I was done plating, but Kevin had a brilliant idea – maple syrup. Bathe the waffle and egg in some great Canadian liquid gold and make sure some runs onto the plate so you can sop it up after with your waffle. Lessons learned during this process: Never buy medium sized eggs, they don’t have enough yolky goodness to produce a good runny egg picture . 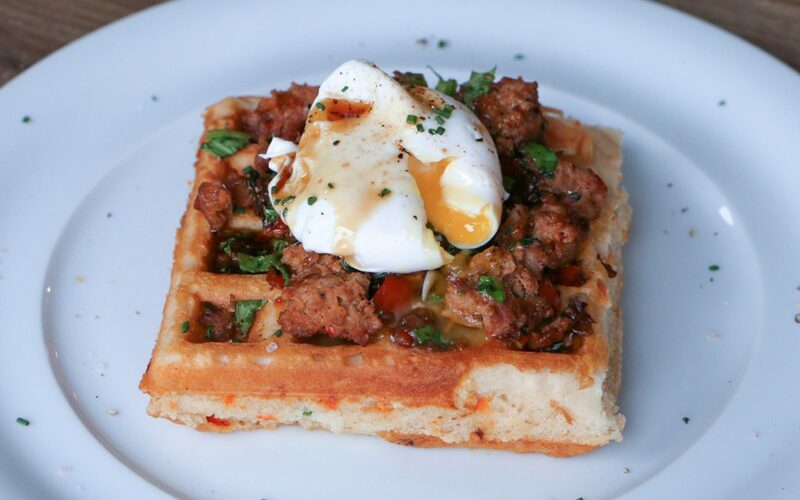 Breakfast waffles made only better with the addition of sausage, egg, and maple syrup! 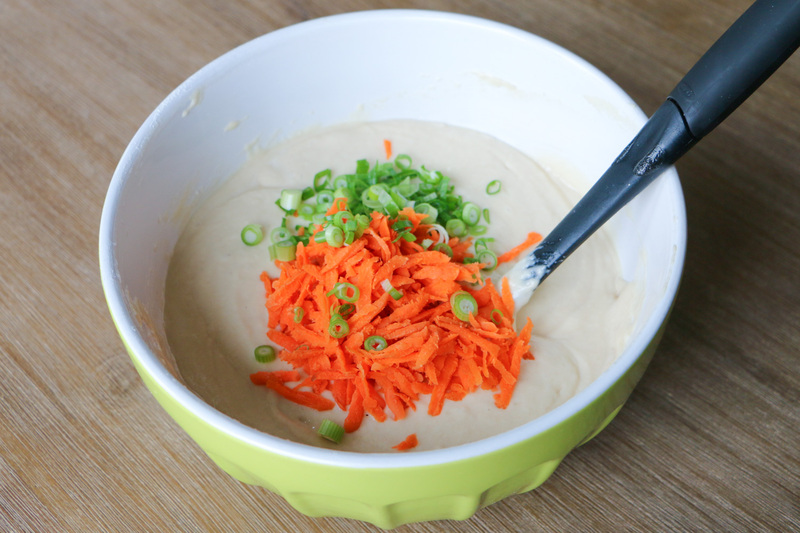 Make the waffle batter and then mix in the grated carrots, green onions, and cheese (optional) then set aside. Add enough oil to coat your cast iron skillet and heat to medium. Add the sausage to the pan and fry until nicely browned and cooked throughout. Reserve the sausage in a bowl. Drain any excess oil. Add the minced onions to the pan and sauté for 2-3 mins. Add in the minced garlic and cook for another 3-4 mins until the onions are nicely softened. Add the mushrooms and red pepper and cook for another 3-4 mins until softened. Salt and pepper to taste (remember not to add too much as the sausage is salty itself). Add the chopped kale to the vegetable mixture, cook just briefly until the kale is softened. Then add the cooked sausage back into the pan and mix all the cooked ingredients. Set your oven to 180 F and put the skillet in the oven to keep warm (make sure your skillet is oven safe, if not use an oven safe dish). Note: The oven will also be used to keep the waffles warm while the eggs poach. 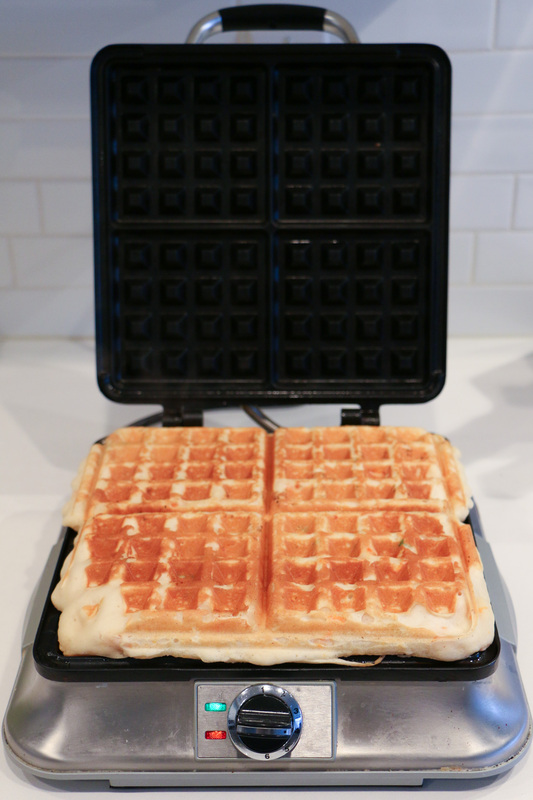 Heat your waffle iron (to your usual setting, mine is typically set to medium). When hot, oil well, add the batter and cook until done. Note: If the waffles are done before you’ve finished poaching the eggs, put the waffles on an oven safe plate and keep it in the oven until you are ready to serve. While the waffle batter is cooking, bring a medium covered pot to a rapid simmer and add in a splash (about 1 Tbs) of vinegar. The vinegar will help the egg whites set (coagulate). Reduce the heat and keep the water at a slight simmer (so the yolk won’t break in the rolling boil). One egg at a time, crack an egg into a ramekin or small dish. Gently swirl the water and carefully add the egg into the centre (this will help the egg whites wrap around the yolk to form a nice little ball). If you are careful you can do more than one egg at a time. Turn off the heat and cover the pot. Check the eggs after 3-4 mins with a slotted spoon until the desired firmness is reached. When it’s done, gently place on a paper towel lined plate to drain the water. 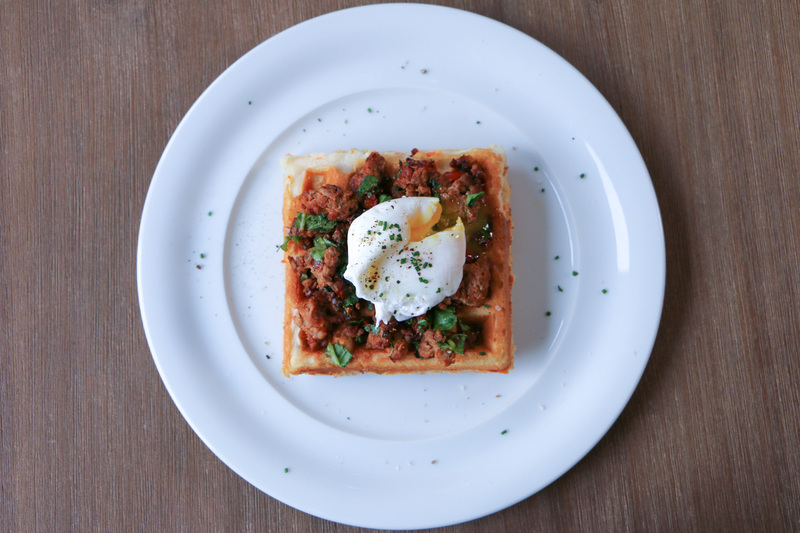 To plate, add the waffle on the bottom, then the sausage mixture, and top it off with the poached egg. Crack some salt and pepper onto the egg. Garnish with chives and drizzle maple syrup overtop.